If I say that the tavern Stari podrum Momjan is maybe the best tavern in Istria, I'll not be telling you anything new. Many blog posts have already been written on Stari podrum Momjan. And probably majority of foodies in Istria would agree with me. But I simply need to be just another one to brag about tavern Stari podrum Momjan. Located just few kilometers from Momjan, in a village Most, tavern Stari podrum is not a place you can just stumble across. It's well off the beaten path. The surrounding area is very scenic. The tavern lies at the bank of small water creek Argili with a nice view over Momjan's Medieval Castle. It's surrounded by vineyards and olive groves. Popular Kozlovic Winery is just few hundred meters away. Tavern has a nice rustic interior with a big open fireplace, big garden and a covered outdoor terrace. Interior is tiny and cannot accommodate more than 30 people. Terrace is nice with enough spaces between the tables. It can accommodate additional thirty persons (weather permitted). This place is very popular among locals, but also among Slovenians and Italians. t's always busy, and the reservation is needed. Just call few days in advance to secure your table. Don't forget that the place is secluded, and well off the beaten path. It's not like there is another restaurant just around the corner. Beside, you don't want to eat at another place. Because this area, you visit because you want to eat at Stari podrum, or you just don't visit it at all. Tavern Stari podrum Momjan is family-run restaurant. A mother, Mira, is in her fifties and she's the chef. Two daughters serve the tables, while son-in-law is in charge of BBQ. Sometimes there is another lady who buses tables. Staff makes you feel very welcome. It might be your first visit to their restaurant, but they'll make you feel at home. You'll feel like you've been there many times before and you really know the place and the people well. Special feeling in a truly special place. Atmosphere is laid back. Be ready to wait a bit. I never mind waiting in a place like this anyway. The surrounding is nice, vibe is very positive, and the signal for cell phone is very weak. So really, what's your excuse for not kicking back and just enjoying your meal. And food? Oh, my God…., the food is so delicious that I don't even know where to start (without getting hungry!). We are talking hearty traditional Istrian dishes with a twist. There is always some secret ingredient, something that sets food at this tavern apart from all the others. For example, if you order mashed potatoes, they'll be finished in a pan, a bit fried on both sides. Simple, but different! And so yummy! We eat often at this tavern, so I could write a long post on the food they serve. But I am not going to list here the entire menu. It wouldn't make lots of sense. Instead, I'll just give you an overview of our typical meal there. First, you are always served a toasted bread with a simple homemade cheese spread with grated black truffles. This tidbit comes on the house. We love soups at tavern Stari podrum, and our favorite one is garlic and potato soup. This is a creamy soup with small pieces of carrots and potatoes, and really subtle garlic taste. We always add a few drops of olive oil to our soup to enhance the taste. Extra virgin olive oil always comes complimentary with your meal (this is almost the case in every restaurant in Croatia). Next thing we order is a three kinds of pasta: local pasta, fuzi with truffles; pljukanci with wild dandelion greens (seasonal! ), and gnocchi with chicken stew (farm free chicken, of course!). Their pasta dishes are served in a bowl to keep it warm as long as possible. Truffles are genuine, and they taste great. They have a cute ritual with black truffle pasta. Pasta comes at the table topped with grated black truffles. Once you acknowledge the real truffles are in your dish, they'll mix the past in front of you. This is normally enough food to keep us full for the week. But when we feel the superpower we'll proceed with grilled homemade sausages and tenderloin. Cakes are always homemade. And we like their pannacota with berries, and tiramisu. The price per person for the 3 course meal (skipping the tenderloin and sausages) with a glass of house wine and a coffee is 140 kn (approx. 19 euros). Also, not to make you believe we are gluttons, we don't normally order full portions. You can just ask for more things but in smaller quantities. They'll happily serve you. This way you have a chance to taste more dishes without eating excessively. Beside our favorites, tavern Stari podrum offers very good steaks including boskarin steak (an Istrian cattle). During the summer months, very popular dish is a “red” soup – a homemade tomato soup. Just read your blog about Konoba Stari Podrum. It sounds delicious! My husband and I LOVE off the beaten path destinations. We are leaving in three days for our first trip to Croatia. We will be spending four nights in Rovinj and will have a car for three days before we move to Plitvice Lakes NP. We are a retired couple in our mid sixties. My husband is a photographer. 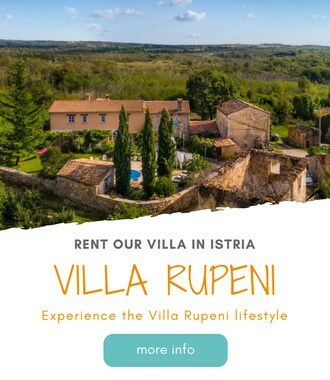 Any other suggestions for our time in Istria would be welcomed. Hi Phyllis, sorry for my late reply. However, I hope you enjoyed your stay in Rovinj and Istria. Let us know if you discovered any hidden gems yourself.